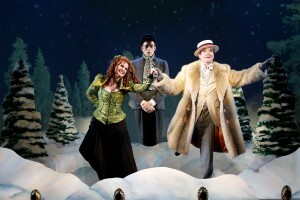 Heather Ayers, Ken Barnett and Jefferson Mays in A Gentleman's Guide to Love and Murder. Photo by Joan Marcus. Hartford Stage has a long-standing commitment to developing new plays and has produced over 70 world premieres in its first 50 years. Plays commissioned, developed, and produced by Hartford Stage have gone on to receive productions regionally and in New York – both on and off Broadway. Recent world premieres include Steven Lutvak and Robert Freedman’s musical A Gentleman’s Guide to Love and Murder (which was honored with four 2014 Tony Awards, including Best Musical and Best Direction of a Musical by Darko Tresnjak); Daniel Beaty’s play with music, Breath and Imagination; Big Dance Theatre’s Man in a Case, a dance-theatre piece with Mikhail Baryshnikov; and Quiara Alegria Hudes’ Pulitzer Prize-winning Water by the Spoonful. The new play programs are run by Director of New Play Development Elizabeth Williamson. A dramaturg, director and translator, Williamson has developed new work with Brooke Berman, Bill Cain, Sheila Callaghan, Robert Freedman, Kyle Jarrow, Matthew Lopez, Steven Lutvak, Wendy MacLeod, Brighde Mullins, Janine Nabers, Dan O’Brien, Dominique Serrand and Steve Epp, Octavio Solis, Bess Wohl, Lauren Yee, Mary Zimmerman, Big Dance Theatre and The Moving Company. She was formerly Associate Artistic Director and Literary Manager at Pioneer Theatre Company and has worked at About Face Theatre, the American Conservatory Theater, the Bay Area Playwrights Festival, Court Theatre, HERE Arts Center, the La Jolla Playhouse, Lorin Maazel’s Castleton Festival, Steppenwolf, Theatre de la Jeune Lune, the Williamstown Theatre Festival and other companies. Education: BA, Bennington College; Master’s, Oxford University; trained at the École Jacques Lecoq & with Complicite. She received a 2007 NEA Fellowship in Literary Translation and is a member of the Lincoln Center Theater Directors Lab and the Literary Managers and Dramaturgs of the Americas. Teresa Avia Lim, Ray Anthony Thomas in Water by the Spoonful. Photo by T. Charles Erickson. Hartford Stage’s main new play activities consist of 1) commissioning new plays via the Aetna New Voices Fellowship, 2) developing plays in readings and workshops, and 3) producing new work as part of our Mainstage season. From 1998-2013 the theatre’s development activities consisted primarily of an annual festival of readings of new work, Brand:NEW. Shows developed as part of the festival include Lisa Kron’s Well, Tony Kushner’s Homebody/Kabul, Craig Wright’s Grace and others, many of which have gone on to receive productions at Hartford Stage, regionally, and in New York both on and off Broadway. 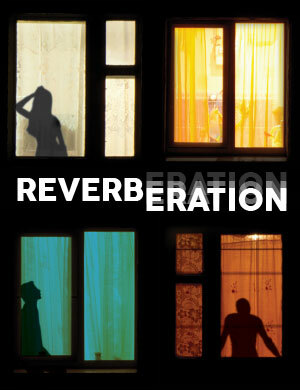 Thirteen plays developed in Brand:NEW have been produced at Hartford Stage, including the upcoming world premiere of Reverberation by Matthew Lopez. 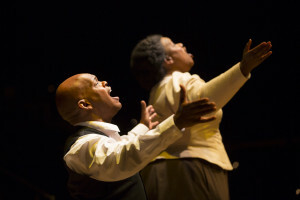 Jubilant Sykes and Kecia Lewis in Breath & Imagination. Photo by T. Charles Erickson. While the festival model served many plays well, it wasn’t right for all of them. Some pieces need longer developmental periods, some need closed workshops with no audience, and it’s often necessary for the theatre to hold workshops at other times of the year. For productions like Man in a Case, several week-long workshops were necessary to develop the piece, and they were not open to an audience. The Hartford Stage workshop of A Gentleman’s Guide to Love and Murder was focused only on the first act, and it wouldn’t have been appropriate to bring in a full audience to see the work at that stage. As Hartford Stage broadens the scope of the new work it produces to include movement-based theatre and musical theatre projects like these, it needs to change its model of development in order to serve them. Instead of the festival model, where each piece was given the same developmental format, the theatre is now structuring new play development around the artists and the work that it hopes to produce over the next few years. This will enable the theatre to continue developing the exciting and challenging kinds of new work it’s been embracing over the last few years, such as A Gentleman’s Guide to Love and Murder, Breath and Imagination, Man in a Case, and Reverberation. Learn more about Elizabeth Williamson and her role at Hartford Stage here.